Pneumonia affects millions of Americans each year, usually only requiring medication and rest as treatment. But did you know that it can also have some serious complications, particularly for older adults? The condition, which is an infection of the lungs, is usually fairly easily treated. But not always. Each year, according the Centers for Disease Control & Prevention, around a million Americans end up in the hospital because of pneumonia. And of that million, around 50,000 die from complications of pneumonia. That number seems staggering, especially since most people only think of the condition as a relatively unserious condition. Most cases of pneumonia will go away with treatment, but for certain populations, including those with compromised immune systems, such as the very young and older adults, it isn’t that simple. Read on as we take a look at the dangers of pneumonia for seniors — and why the vaccine is important. Pneumonia is an infection of the lungs that’s typically a complication of a different respiratory infection, such as the flu. The condition has many causes, including both bacteria and viruses. Even if you originally have viral pneumonia, you are still at risk of developing bacterial pneumonia. If you develop pneumonia, you may experience a wide variety of symptoms that vary in severity, including a cough, fever, chills or the “shakes,” shortness of breath, excessive sweating, a loss of appetite, extreme fatigue, and chest discomfort when breathing or coughing. Older adults may also develop confusion as a symptom of pneumonia. Who’s at risk of developing pneumonia? The short answer — everyone. But certain groups are at a much higher risk, particularly of the serious side effects that can accompany pneumonia. Wash your hands. We’re in the middle of cold and flu season right now, when it’s even more important to wash your hands often. But it’s a key preventive step year-round. Wash your hands often throughout the day, particularly after you go to the restroom or change a diaper, blow your nose, touch commonly touched surfaces (like doorknobs or desk phones), and before you eat or prepare food. This step can help prevent the spread of common respiratory infections that can turn into pneumonia. Don’t smoke. Tobacco negatively impacts your lungs’ ability to fight off infections of all types — and smokers are at a high risk of developing pneumonia. So, if you smoke, stop. And if you don’t smoke, don’t start. Live a healthy lifestyle. You’re familiar with the basics of healthy living, but the positive impact of a healthy lifestyle can’t be overstated. A strong immune system is key to fending off illnesses, and exercising regularly, eating a balanced diet and getting plenty of quality sleep are three steps you can take to boost yours. Beyond these basics, though, vaccination is also important. We’ll talk about the pneumonia vaccine and why it’s important for older adults in a moment. But first, let’s talk about other vaccines. Because pneumonia develops as a result of another infection, you can help prevent pneumonia by taking steps to prevent other types of infections. That includes vaccination against measles, pertussis (whooping cough) and chickenpox, along with an annual flu vaccine. First, consider this: Pneumococcal disease is tied with other conditions, not just pneumonia. Older adults are at a particularly high risk of pneumococcal disease, which can lead to a number of severe infections, including those affecting the lungs (pneumonia), the bloodstream (bacteremia) and even the spinal cord and brain (meningitis). Vaccination is the single best way to prevent a pneumococcal infection. There are two different pneumococcal vaccines — PCV13 and PPSV23. Both are primarily recommended for adults age 65 and older. 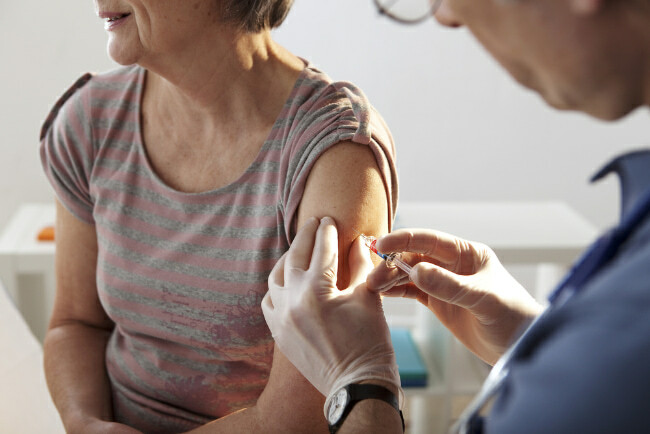 The PCV13 vaccine, which protects against 13 strains of pneumococcal bacteria, is also recommended for adults age 19 and older who have specific health conditions. The PPSV23 vaccine, which protects against 23 strains of pneumococcal bacteria, is also recommended for adults age 19 and older who have specific health conditions or who smoke. The CDC recommends adults age 65 and older receive both vaccines, but not at the same time. You should get PCV13 first, then talk with your healthcare provider about when to get the second vaccine. The pneumococcal vaccines are typically cost-free under most health insurance plans for those age 65 and older. Talk with your doctor about whether vaccination is right for you. Need a primary care physician? Dr. James Layman, an East Tennessee native and board-certified family medicine physician, provides primary care to patients 14 and older in the Sequatchie valley and surrounding communities. Learn more or book an appointment at Erlanger Primary Care – Sequatchie Valley today.